Western blot analysis of extracts from RPMI 8226 and A549 cells and human placenta using ABCG2 (D5V2K) XP® Rabbit mAb. Immunoprecipitation of ABCG2 from A549 cell extracts. Lane 1 is 10% input, lane 2 is Rabbit (DA1E) mAb IgG XP® Isotype Control #3900, and lane 3 is ABCG2 (D5V2K) XP® Rabbit mAb. 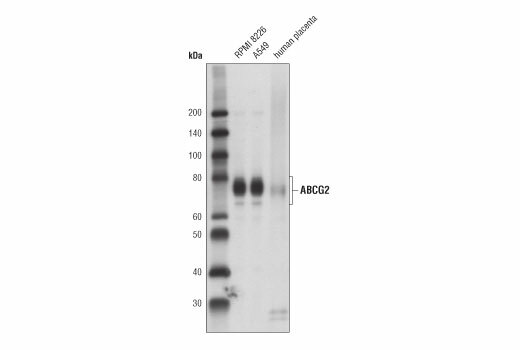 Western blot analysis was performed using ABCG2 (D5V2K) XP® Rabbit mAb. 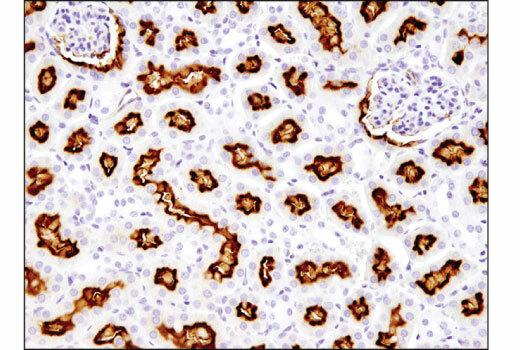 Immunohistochemical analysis of paraffin-embedded mouse kidney using ABCG2 (D5V2K) XP® Rabbit mAb. 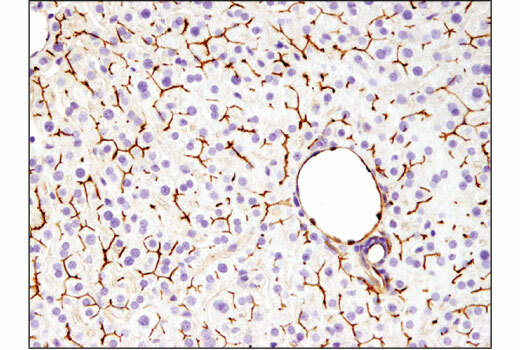 Immunohistochemical analysis of paraffin-embedded mouse liver using ABCG2 (D5V2K) XP® Rabbit mAb. 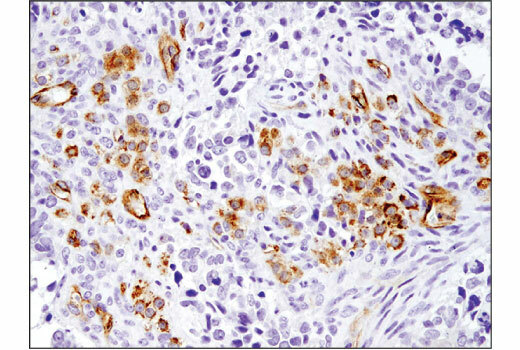 Immunohistochemical analysis of paraffin-embedded human ovarian carcinoma using ABCG2 (D5V2K) XP® Rabbit mAb. 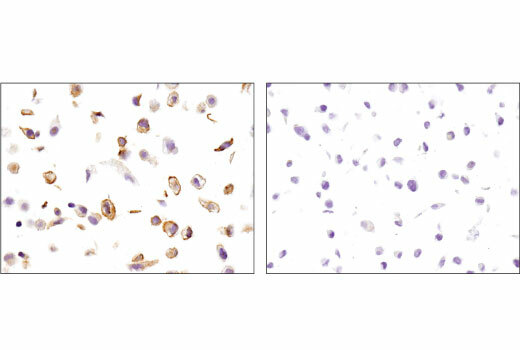 Immunohistochemical analysis of paraffin-embedded A549 (left) and A-204 (right) cell pellets using ABCG2 (D5V2K) XP® Rabbit mAb. 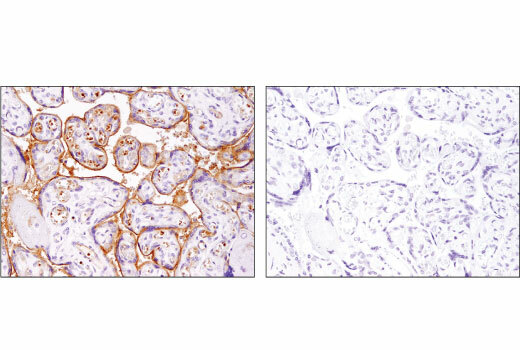 Immunohistochemical analysis of paraffin-embedded human placenta using ABCG2 (D5V2K) XP® Rabbit mAb in the presence of control peptide (left) and antigen-specific peptide (right). 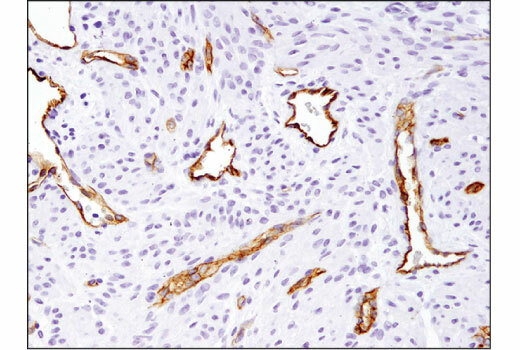 Immunohistochemical analysis of paraffin-embedded normal human uterus using ABCG2 (D5V2K) XP® Rabbit mAb. 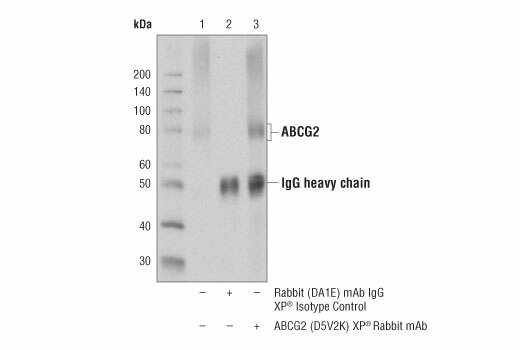 ABCG2 (D5V2K) XP® Rabbit mAb recognizes endogenous levels of total ABCG2 protein. Monoclonal antibody is produced by immunizing animals with a synthetic peptide corresponding to residues surrounding Asp175 of human ABCG2 protein.